So, now that we’ve been through most of a full season, from preparing the ground and putting in the trellis, to planting and nurturing the vines all the way through the “harvest” (three clusters that grew despite our efforts to keep the vines free of fruit), I think it’s time to enjoy a glass of someone else’s wine, reminisce happily about how well everything turned out, and then get down to the serious business of evaluating what we did right and what we did wrong. On the plus side, I think we got a lot of things right. We spent more time than I care to remember researching and thinking through what varietals we would plant and more specifically, what clones would do best on our property – 740-feet above sea level, on a steep, westward facing slope in Afton. We settled on four grapes – Cab Franc, Petit Verdot, Viognier and Petit Manseng – and I’m very happy with the choices we made. We’re thinking of putting in some Merlot next spring, but I think the four we started with are great grapes for Virginia. My job was to dig the holes. 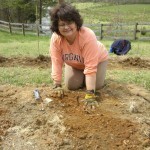 . .
And my wife, the Vineyard Goddess, did most of the planting. 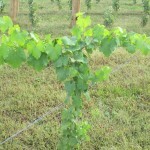 We decided to go with ENTAV clones, and worked through three different nurseries to get the vines we wanted. For the record, we ended up getting ENTAV 214 Cab Franc; ENTAV 573 Petit Manseng; ENTAV 400 Petit Verdot; and ENAV 642 Viognier. We put all of them on 101-14 rootstock. 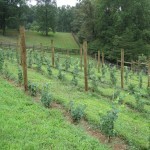 Some nurseries were better than others for a small vineyard like ours. We spent more money on 25 Viognier vines from one of the nurseries than we did for 50 Cab Francs from another. We justified the Viognier purchase by telling ourselves that it would be a helpful to develop a relationship with multiple nurseries. Good theory. But we got a note a few months ago from the expensive nursery that loan sharked us those Viognier vines announcing that they were no longer taking orders for next year. I guess our 25-vine order didn’t make much of an impression. Well, so much for theories. 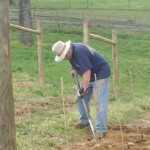 Continuing on the plus side, we hired a contractor to get posts in the ground for the trellises and the H-brace end-post system. I had wanted to do that work myself (which is to say, I wanted so badly to buy the auger and bits for my tractor), but with spinal surgery pending in May, I had to contract the work out. Later in the spring, I was at least able to run the bottom wire myself, and that was both fun and satisfying. We also managed to get a deer fence up. Again, with my surgery falling between the start and the finish of that work, my primary contribution was to watch very hard (honestly, really, really hard) and to offer some advice. The real work was done by my wife and daughter, Chris and Kate, and they did a magnificent job. I will never forget the sight of Chris and Kate wielding sledge hammers to drive three-foot post holders into the ground. 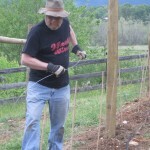 And finally, in April, we planted the vines, a whopping 150 of them. 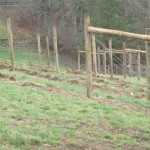 We hilled the vines over until warmer weather arrived, and maintained the vineyard the best we could. It was a true joy to watch them grow, from dormant sticks to honest-to-God, bona-fide grape vines. We were pretty disciplined about sticking to a spraying schedule (and by “we,” I mean Chris), and I think our vines made it through the first year pretty much disease free. One of my favorite memories of the summer was the evenings I spent walking through the vineyard, astonished that I had something large enough to accommodate an actual walk. But we did make some mistakes along the way. And I’m doing my best to catalog them all so that we can do a little better next year, when we plant more vines. 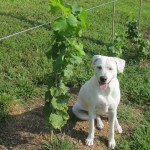 Glory, the-Vineyard-Dog-in-Training, standing guard over a vine. First, we decided to dispense with grow tubes for reasons that I still think made good sense. After sampling the research, we concluded that vines grown without tubes would do at least as well during the first season as those grown with tubes, and maybe better in subsequent years. 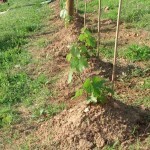 Honestly, it somehow just felt right to let the vines toughen and grow at a natural pace. We also recognized that the main reason for using grow tubes was to facilitate the use of Roundup, and with only 150 vines we thought we could cultivate the rows by hand. Okay, it was another great theory, and quite possibly it would have worked if I had not been out of commission for part of the season. But in practice, it was very hard to keep the rows clean and free of competing weeds. We used Roundup before planting, and throughout the growing season we cultivated the best we could. But keeping up with the grass and weeds in the row, even for a vineyard as small as ours, was a challenge, and we now know there was less clean space under the vines than there should have been. A simple experiment proved that. 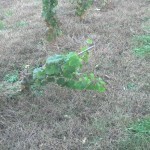 A couple of vines leaning to the ground – this is not a good thing. For comparison’s sake, we sheltered a dozen of the Viognier vines so that we could use Roundup in the row just once midway through the growing season. The vineyard floor around those vines was beautifully clean, and they grew so much larger than the vines right next to them that didn’t have the benefit of Roundup. While that sample wasn’t large enough or random enough to allow us to draw an empirically sound conclusion, the evidence did seem pretty conclusive. 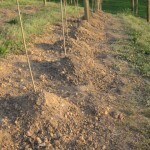 Now we’re working on how best to tackle the cultivating next year so that we give the vines more room to grow. Let me say this, though, in defense of the approach we took this past season. I would much rather do without herbicides if at all possible. I don’t like the idea of dumping chemicals onto the vineyard floor, killing off weeds, but who knows how many beneficial plants and beneficial insects housed by those plants at the same time? 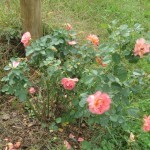 I would like to find a way to cultivate without herbicides. And as the vines mature, and develop deeper root systems that won’t be competing for water and nutrients with the other grasses and weeds, I don’t think it will be nearly as important to keep the floor clean. 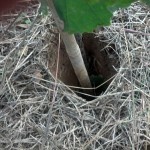 Another lesson came late in the season, when Hurricane Sandy visited our vineyard and exposed another small mistake. We had used bamboo poles as support stakes, and they seemed sturdy enough when we put them into the ground. 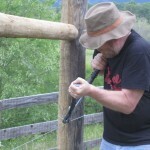 It didn’t occur to me, however, that we should clip the poles to the trellis wire. In any event, when we surveyed the vineyard after Sandy had passed through, we found a number of vines that had literally been blown over, along with their support stakes. In every case, these were vines that had not reached the cordon wire, and were therefore being held in place only by the stake. Vines that had reached the wire and been tied off seemed to do okay. I think it’s pretty obvious that a clip at the top of the stake would have provided a lot more support. I had actually talked to a vineyard manager a month before Sandy about the clips. We didn’t really get into the reasons for using them, but when I said I hadn’t, he asked, “why not?” All I could say was that I hadn’t known to do it. I made a mental note to buy the clips and secure all the poles, but with everything looking so good, it didn’t seem urgent. Well, now I know. 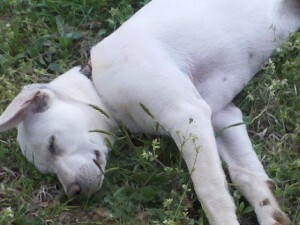 the vineyard with us and proved to be a champ at keeping birds and rabbits out of the vineyard. Not to mention, beetles. We aggressively met our one Japanese beetle infestation with a spray application and a lot of handpicking, but it turned out that the puppy also likes to help pick off the beetles, and she does so without harming the leaves. Go, Glory! Other mistakes? I’m sure there are dozens that I don’t know about, in addition to a few more that I do. We went for close spacing (3 feet), but in retrospect, I wish we had gone for an extra four to six inches. We’ll see how it works out, but every time I look at the vines, I wonder if their vigor can be contained in that tight space. We were good about spraying, but since we don’t live on the property full-time, we weren’t perfect. And I think we need a refresher course on dormant winter pruning sometime in the next few months. But the vines are still there, they look wonderful, and I’m still confident that someday, not too many years from now, when I reflect back upon the summer, I’ll be drinking a glass of wine from those grapes and maybe laughing over some of the rookie mistakes I made. And yes, I think I’ll always remember that first year in the vineyard – the first vine I planted, the first time I experienced bud break, and the taste of those first errant grapes that weren’t supposed to be there. I’ll remember the mistakes too. But I know for sure that the things we did wrong will pale in comparison to the triumphs of that first glorious season. Wonderful review Bob. 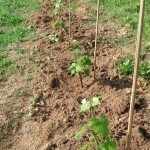 My very little vineyard, all hand tilled and cared for, survived year 1 as well. Now I’m about to bid on one or two parcels of land near my home for more planting this year, I hope. Keep up the good work. If you have any comments on tractors, sprayers and other equipment for purchase or lease for a small vineyard, let me know. Steve, nice to hear your vineyard did so well! Hope you find some great land to expand onto. BTW, have you ordered vines yet? There have been a lot of stories about shortages at nurseries this year. 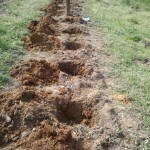 Seems that many vineyards had cut back during the recession, but now feel it’s time to start planting. I have a John Deer 2320 with a front end loader and a 54″ mower deck. works great for me, and I think it would be fine for a much larger property. 3-point hitch, so you can add accessories. We have significant slopes and it does fine going up and down – and I always have it in 4-wheel drive on the slopes. 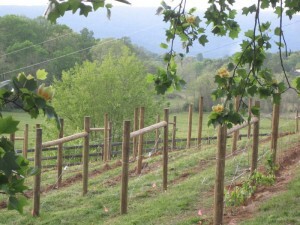 BTW, have you joined Virginia Vineyards Association? Great organization, lots of educational programs during the year. Am a member of the VVA; thanks for info on the tractor (I’ll need to buy one soon). BTW, did you use a vineyard consultant or did you and your wife do your work by yourselves? Will stay in touch.